Jeff Fialko is an American artist and musician. The deck is painted with ink and watercolor in a sort of Marvel-Comic-Style. Some card images have more elements of RWS (Magician / High Priestess) others more of Marseilles (Sun / Lovers). The numbering with Justice at VII and Strength at XI is Marseilles. The cards are numbered but without title. It is a signed and numbered limited edition of 50, mine is number 35. 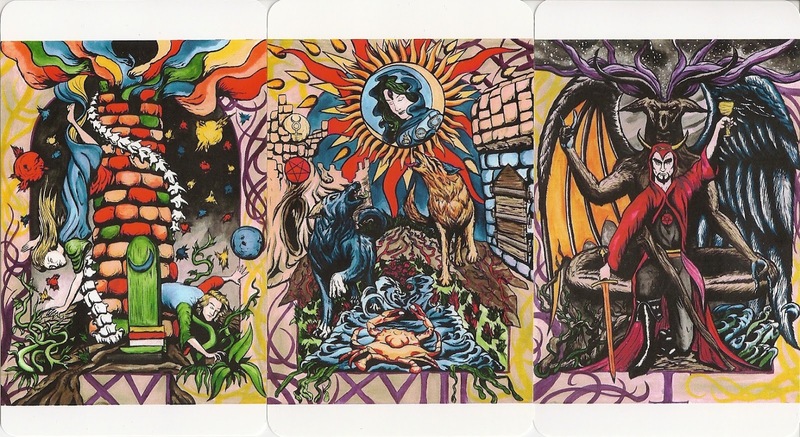 The Fialko Tarot is number 24 of Adam McLean's "Art Tarots" series. This deck is made cheaper than the earlier editions, the cards are without lamination, there are no card backs printed and it has no custom made but a transparent acetate box. Justice and Strength are numbered like in Marseilles type decks. Also the sun and the lovers card are more Marseilles like. But I still think that card number I in the Fialko Tarot shows a Magician(RWS) and not the Juggler(Marseilles) and card II is a High Priestess(RWS) and not a Papess(Marseilles). In addition I think that I see a lot of Golden Dawn/Book of Thoth attributes on the cards. But you have a point with the Marseilles elements and so I changed my typification to Mixed.